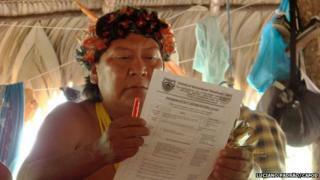 One of Brazil's most prominent indigenous leaders has called for police protection following a series of death threats. Davi Kopenawa of the Yanomami tribe in the Amazon rainforest said armed men had raided the offices of lawyers working with him. He said they were hired gunmen who had asked for him and wanted to kill him. In February a major operation began to evict hundreds of gold miners from Yanomami land. Davi Kopenawa has been at the forefront of the struggle to protect Yanomami land for decades. He told the BBC: "Illegal gold miners are still invading our land. They have leaders who organise the supplies and transport and support the invasion of our land. Ranchers have also invaded with their cattle. "This group is angry with me because I send the police and Funai (Brazilian Indian Agency) in to destroy their rafts and dredgers. "The gold dealers in town have money to hire gunmen to get rid of me." Davi Kopenawa said last May that the association he heads had received a message from gold miners that he would not be alive by the end of the year. He has registered his concern with the police and made a formal request for protection for himself, his son and colleagues. A friend of environmental activist Chico Mendes, who was killed in 1988, Davi Kopenawa has travelled abroad on many occasions to raise awareness of the urgent need to protect the Amazon rainforest from destruction. According to Survival International, of all the indigenous territories in Brazil, Yanomami lands receive the most requests for licences from mining corporations.